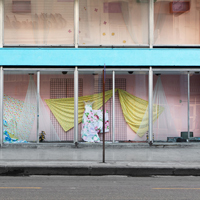 The Cecille R. Hunt Gallery at Webster University will present an exhibition of photographic art by artist Alexa Hoyer BFA '03, whose work explores how the economic blockade against Cuba is met with innovation via storefront window displays. The opening reception will be held Friday, Sept. 28, 6-8 p.m. Hoyer will speak briefly about her work at 6:45 p.m. The event is free and open to the public. The show will be open through Nov. 2. “Montaje Al Aire” (Air Mounting) is a technique of window dressing unique to Cuba, which suspends goods and materials from the ceilings using fishing line, wire or string. It was created out of necessity due to the lack of mannequins and pedestals. Opening Reception: Sept. 28, 6 p.m. - 8 p.m.
With a background in sculpture, Alexa Hoyer now works mainly in photography and has exhibited internationally, including recent exhibitions at the Marjorie Barrick Museum of Art in Las Vegas, NV, the Glyndor Gallery / Wave Hill in New York City, the Inside Out Arts Museum in Beijing, a video installation at the Eastern State Penitentiary in Philadelphia, Pennsylvania, and at the Contemporary Arts Museum in Houston, Texas. She is also currently working on a collaborative project with Sage and Coombe Architects documenting derelict structures throughout New York City. Her photographs were recently published in Vice.com and Wall Street International. Born in Hamburg, Germany, Alexa received a BFA in 2003 from Webster University in Saint Louis, Missouri, and an MFA in 2005 from Tyler School of Art in Philadelphia, Pennsylvania. She currently resides in Brooklyn, New York. For more information, call 314-246-7171.